Hudson County’s longest severing Volunteer EMS organization, providing free Emergency Medical Services to the community since 1969. 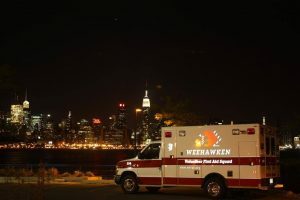 For almost fifty years, the Weehawken Volunteer First Aid Squad (WVFAS) has been there when Hudson County’s citizens needed help. WVFAS also provides emergency medical response to neighboring communities in North Hudson (such as Union City, North Bergen,West New York, Jersey City and Hoboken) via mutual aid agreements. Our services are free of charge to all of our patients. You (or your insurer) will never receive a bill from the WVFAS.